The world has never been as dangerous as it is today: terrorist threats, nuclear proliferation, ongoing conflicts in the Middle East, Africa and even Asia, demographic imbalance, aggressive economic competition and the irrevocable rise to power of the emerging countries, tension due to the energy issue, major environmental dangers. The only way for us to continue within this context and to help towards a more responsible and stable world is to pool our strengths and advantages – to rally together. The efficient management of these questions today and in the future does not require less Europe, less European solidarity; on the contrary, more solidarity, more is required of Europe. This is the overriding request on the part of European public opinion. This is why I believe that political Europe is necessary now more than ever before: it is a matter of urgency – because the world will not wait for us – to organise the Union efficiently and democratically, to fulfil the aspirations of European citizens for a more familiar Europe that meets their requirements, taking advantage of globalisation and controlling excesses. The idea of the European project has therefore to be renewed. Since the failure of the French and Dutch referenda the European Union has been led into a spiral of depression. Finding the necessary impetus, to make the Union efficient and renew its legitimacy implies finding a solution which improves on the constitutional procedure. As far as this is concerned France has the specific responsibility of initiative and proposal due as much to the "no" to the referendum on 29th May 2005 as to its role as founder country. Firstly I believe that to succeed and convince the issue of the institutions has to be dealt with quite distinctly – the draft Constitutional Treaty was not challenged seriously from this point of view – likewise that of the policies which implies a more in-depth examination, an open debate to evaluate the developments required in joint areas of action such as social policy, immigration, energy, culture or economic management. With regard to the institutions I suggest that a new text be drawn up immediately which, in the shape of an Institutional Treaty, would take over all the measures in part I of the Constitution with regard to the institutions, i.e. most of what is new with regard to the present treaties, in addition to the institutional measures included in part III, which are new as far as the existing treaties are concerned and vital for the application of part I. Indeed this means completing part I with the measures relative to European external activities; to the qualified majority vote with regard to the CFSP; to the updating of the "Petersberg Missions" in the area of security and defence; to "structured co-operation" in terms of defence, to the new rules establishing the annual budget; to the simplified revision procedure. I then propose that the new procedure laid out in the Constitutional Treaty with regard to enhanced co-operation as well as the extension of the qualified majority and the ordinary legislative procedure be integrated into additional protocols. Finally I am in favour of integrating the Charter of Fundamental Rights into the Institutional Treaty in whatever form, since this comprises a major element of the political Europe we so much require. In order to achieve this twofold objective I should like to put forward a methodology and a detailed calendar of events. 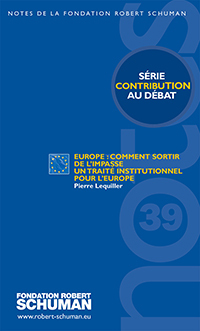 This would require the establishment of an Intergovernmental Conference (IGC) bringing together the Commission and the European Parliament to deal with the institutional issue at the European Council in June – the IGC would finish work at the end of 2007 leading to a draft Institutional Treaty whose ratification by parliament by all the Member States in the same month would be completed by the end of 2008. In addition to this discussions relative to the Union's policies which will necessarily integrate the improvements made in the draft Constitution should be started by the IGC in 2007 and be concluded by 2009 at the latest and ratified in 2010. The European elections of June 2009 will therefore be an opportunity for a major democratic debate on policies. I suggest that these discussions on the institutions as well as on the policies include the close co-operation of parliamentarians, both European and national within the framework of regular inter-parliamentary meetings – at least every two months. To my mind this proposal might serve as a centre point for the various points of view of the different players involved if everyone makes an effort – this covers those who want to maintain the text as it is and those who want to re-write it completely : the eighteen States who have already ratified the initial project representing 56% of the Union's population; France and the Netherlands who voted "no" in 2005; the seven countries who for various reasons still have not submitted the text for ratification which they did however approve in June 2004.